This post is brought to you by a local Starbucks. We have plenty to choose from, but I chose the one my brother works at this morning. There are some perks with him working at a favorite place of mine. Free bags of coffee or tea every week just being one of them. Anyway, even though my weekend isn't quote over I thought I'd go ahead and share with you what I did. I participated in the latest Cara Box exchange and that post went live today, so go check out all the great boxes that were shipped out recently! 1. Friday I came home to two packages. I absolutely love mail and not only did my Birchbox come in, but my first Zulily package with a UCF Scarf came in!!! 2. I had a hearty breakfast of bacon and eggs that included Trader Joe's Pumpkin Waffles and they were delish! 3. UCF had an away game that wasn't televised for me so I had to literally watch the last few minutes of the game by updating Twitter. We won! 4. Starbucks had a wonderful BOGO program featuring their Holiday drinks over the weekend and of course I indulged! 5. I think I actually succeeded with my second attempt at Trader Joe's pizza dough by prebaking the crust. Sooo good! 6. My brother and his band had their first live stage show at a local bar and rocked the house! Proud big sister!!! 7. My awesome dad is helping me build a game for a Christmas gift for a friend. He's having fun with it I think. He likes a good challenge. 8. Ipsy sent me their package on Saturday!! I just love getting things in the mail, lol. 9. Sunday we went to a craft fair because Saturday was super rainy, yuck. I didn't buy anything, yay and it was SUPER HOT! Like 80 degrees in November. What the Florida?! So that was my weekend. I read some books, watched a movie and got caught up on Chicago Fire. I did get out more than I thought I would but I try not to turn down chances to live a little! How was your weekend? Was it exceptionally warm where you live or do I get to be envious of your Fall weather? 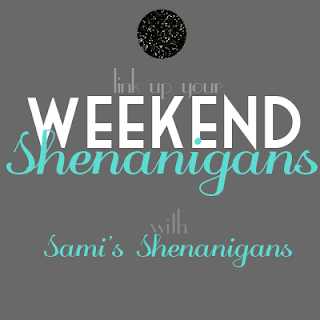 I'm linking up with Sami today! You got the It's A 10 in your BB! No fair! :( If you haven't used it - DO! It's amazing stuff!! !